Borders has stopped taking orders for new books on its website while the retailer "is in discussion with potential buyers". The firm said that existing customer orders are also being delayed but will be fulfilled. The Borders Entertainment part of the site - which sells DVDs, CDs and electrical items - continues to operate as normal. Some publishers are also reported to have severed links with the retailer. When customers try to order a book on the website they receive a message saying: "Sorry, title cannot be purchased." Reports have suggested that Borders, which has 45 stores in the UK, does not have enough cash to last until Christmas. It is thought it could go into administration if no buyer is found. Talks with WH Smith reportedly collapsed last week. 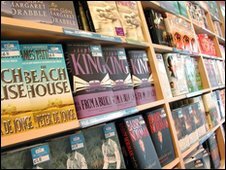 There is also speculation that HMV, the owner of Waterstones, is in talks to buy some of the stores. HMV refused to comment. Borders, which also owns Books Etc, has suffered from increased competition from online retailers, such as Amazon, as well as supermarkets. The Borders chain was originally owned by the US book giant of the same name but was sold in June 2007 to Risk Capital Partners. Risk Capital then sold it on to the private equity firm Valco earlier this year.